Great Red Spot Is On The Planet Jupiter. The Great red spot is a swirling storm located on Jupiter. Great Red Spot is a persistent anticyclonic storm on the planet Jupiter. 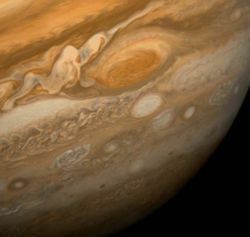 The Great Red Spot on Jupiter is 22º south of the equator, which has lasted at least 340 years. The storm is large enough to be visible through Earth-based telescopes. The Great Red Spot on Jupiter was probably first observed by Cassini, who described it around 1665. The Great Red Spot as seen from Voyager 1 in 1979. Approximate size comparison of Earth and the Great Red Spot. Great Red Spot colour animation of Jupiter's cloud motion. An animation of the Great Red Spot of Jupiter. This dramatic view of Jupiter's Great Red Spot and its surroundings was obtained by Voyager 1 on February 25, 1979, when the spacecraft was 9.2 million km (5.7 million miles) from Jupiter. Cloud details as small as 160 km (100 miles) across can be seen here. The colorful, wavy cloud pattern to the left of the Red Spot is a region of extraordinarily complex and variable wave motion. To give a sense of Jupiter's scale, the white oval storm directly below the Great Red Spot is approximately the same diameter as Earth. The oval object rotates counterclockwise, with a period of about 6 days. 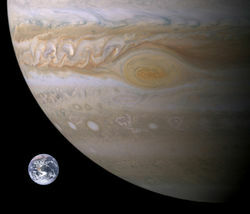 The Great Red Spot's dimensions are 24-40,000 km × 12-14,000 km. 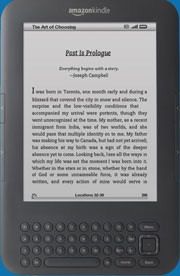 It is large enough to contain two or three planets of Earth size. The cloudtops of this storm are about 8 km above the surrounding cloudtops. Storms such as this are not uncommon within the turbulent atmospheres of gas giants. Jupiter also has white ovals and brown ovals, which are lesser unnamed storms. White ovals tend to consist of relatively cool clouds within the upper atmosphere. Brown ovals are warmer and located within the "normal cloud layer". Such storms can last hours or centuries. Before the Voyager missions, astronomers were highly uncertain of its nature. Many believed it to be a solid or liquid feature on Jupiter's surface. As of 5 June, 2006, the NASA Science website reported that the Great Red Spot and Oval BA might converge. The storms pass each other about every two years, the passings of 2002 and 2004 did not produce anything exciting. But Dr. Amy Simon-Miller, of the Goddard Space Flight Center, predicted the storms would have their closest passing on July 4. Simon-Miller had been working with Dr. Imke de Pater and Dr. Phil Marcus of UC Berkeley, and a team of professional astronomers since April, studying the storms using the Hubble Space Telescope. On July 20, the two storms were photographed passing each other by the Gemini Observatory. No convergence occurred.